Multiple voting options are available including single vote, daily voting, or a set number of votes per contest. Select this option to begin creating a photo entry contest. If you want to only use Admin Entries, make sure to select the "Use only Page Admin Entries" toggle. By removing the "vote" button in Display options you can turn off voting totally until you want to allow fan voting as well. Go into the Manager section and then select the Add App button. After pressing the Add+ button, you will be directed to the App Builder page. This section contains several sections namely Contest Setup, Voting Options, Admin Entries, Live Contest, Layout Options, Rules, Privacy, Pre-Contest, Post-Contest, Security and Delete Entries. The Contest Setup is the first sub-setting of App Builder. It requires you to key in your desired Contest title. This title is not publicly displayed and is for internal use only. You can set the start date and time of your contest as well as its end date and time. You must also remember to set your current time zone from the drop-down list provided on the page. Additionally, you can include email submissions to users you would like to notify regarding the contest. On the other hand, the Enable email check button lets you receive an email of each submitted entry. It is recommended to uncheck this option if you don’t want your email to be flooded by thousands of entries coming in. Premium app users always have access to the export data in the manager. Choose the Entries toggle if you want to add your own entries for fans to vote on. This enables you to load entries of your choice for the contest. Fans can then vote on your entries, and they are not able to submit any entries themselves. You will then add entries under the “Entry Form” setup area. You can add as many of your own entries as you choose. You are able to choose how you would like to display the entries with the “Display entries by” checkbox. Choices include “most recent”, “votes” and “random”. The checkbox called “Entries do not go live on page until page admin approves each” is available at the Premium App level and allows entries to be screened by the TabSite Admin prior to it being live on the fan page. Want votes totally off so no public voting happens? You can by going to Display Options area and de-selecting vote boxes. See that section below. The Admin Entries is the third sub-setting of the App Builder page. Entries for your contest are added to this form. 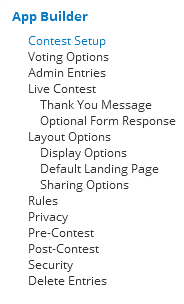 If you have selected to “use only page admin entries”, this is where you create entries for your contest. The Live Contest sub-setting under the App Builder page has its own sub-sections; the Thank You Message and the Optional Form Response. You are able to set your own Thank You Message for users who joined the Live Contest. 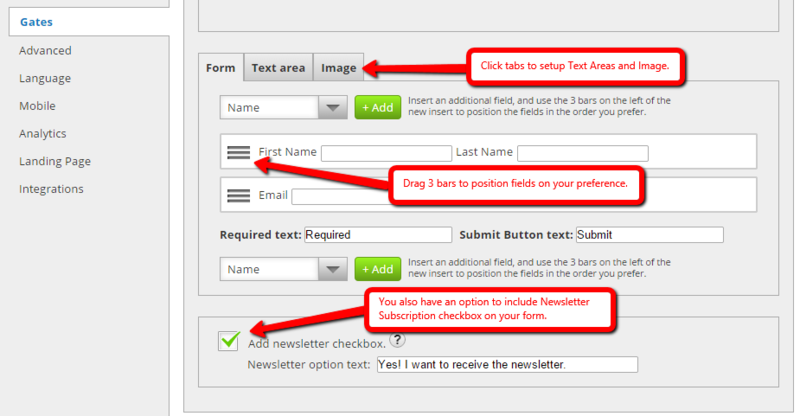 Simply tick the check boxes of the areas you want to customize and include to your message. These comprise of the Text area, Image and Form. The Optional Form Response is the second sub-section of Live Sweepstakes. It enables you to define the behavior of what contestants see after they have submitted to the Thank You Message the optional form. The settings on this page will be disabled and have no effect if a Response URL is used for the “Thank You Message”, or there is no “Thank you Message” is defined. The next sub-setting of the App Builder is the Layout Options. You are able to choose the Aspect ratio of your Layout Options from the drop-down list provided on the page. Choices include 1920 x 1080 (HD), 640 x 480 and 1 to 1 (square). It has three sub-sections specifically Display Options, Default Landing Page and Sharing Options. Note than the entry thumbnails are responsive so on mobile devices 3 rows wide would be converted to 1 column to enable mobile users to have a great viewing experience. The Display Options sub-section lets you show the features of your uploaded photo. It has two displaying options namely Large View or Thumbnail which enables you to “Show title on”, “Show Vote button on”, “Show votes on” and “Show profile pic on”. The “Show profile pic on” displays the user’s Facebook profile picture and name and will link to their Facebook profile when its check box is ticked. OPTION: Want vote button off? Simply uncheck the "Show "Vote" button on "Large View" and "Thumbnail"". This allows you to run a contest where no one votes publicly or where the Page or a designated board votes. Modify the Vote Icon and Share button by replacing their default text, text color and button color. Also, you can enable the Thumbs up button for your vote icon. The Default Landing Page has two options for you to choose; either to vote or to enter the contest. The “Vote” option let users view the present entries from your contest being the first tab while the “Enter contest” let users join your contest on the first tab. Share your features to social media networks using the Sharing Options. It is recommended to tick all the social networks we offer to increase your sharing options. In terms of Rules and Privacy, simply customize these features by replacing the default texts to your own version. See the instruction in “Rules”. When it comes to the Pre-Contest sub-setting, just customize the texts in the Text area. Customize the labels you would like to use for your Countdown. In terms of the Post-Contest sub-setting, just customize the texts in the Text area. Customize the Contest Winner text as well as the number of winners you want to display. This is valuable if you want to showcase multiple winners. They will display from left to right in order of most votes. In terms of the Security sub-setting, select from the two choices you want to give attention to. These choices are Facebook account and IP address. The Facebook account option tracks unique Facebook accounts and merely permits contest entries and votes (per your voting options) from each Facebook account. There is a mini-option for the Facebook account to “Allow only verified Facebook accounts”. For added security, you can enable this option so that only verified accounts can vote (This option does not affect restriction on entering the contest). The feature prevents “vote-buying” from taking place by fake Facebook profiles that have been purchased to vote for an entry. This does force that any account has gone to Facebook’s verification process which requires adding a mobile number to the account, receiving a text message, and then entering this code to verify. In this section, you can easily delete your entry form data. With the help of the Facebook Settings, you will be able to publish your app to a Facebook Page on a tab. You'll just have to connect your Facebook fan page to this app, specify your tab name, 111 x 74 pixel logo and icon. The Promotion Tools section is the third setting from the list. It is consist of four sub-settings namely Social Sharing Options, Blog/Web Call-out Tool, Post Planning and Comment System. The Gates setting allows a visitor checking tool which determines if a visitor is a fan or not. 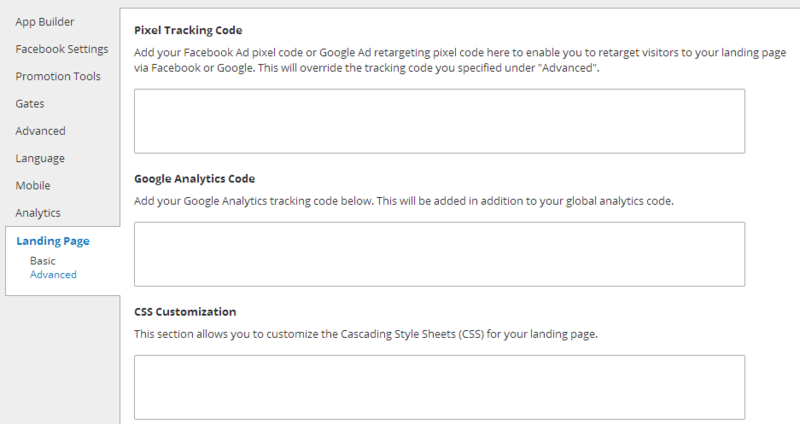 The Advanced setting helps you modify your tab's header image, styles CSS and Pixel Tracking Code. Upload an image first having a size of 810 x 75 pixels. In terms of the Language settings, it is comprised of three sub-settings specifically General, Comment System and Default Text. This allows Admins to completely change the language to be other than English. Just like what you did to your General and Comment System sub-settings, simply modify the texts of your Default Text along with its mini-sections specifically the Entry Form, Live Contest and Post-Contest. It also has the added options like “Vote Instructions”, “Pre-Contest” and “Post-Contest”. All you have to do is upload a corresponding image to each of these sections (follow the recommended image size) and assign its alignment. The Analytics setting is the last one on the list. It has various graphs that display the amount of traffic entering the site coming from different sources. These graphs are composed of Overview, Facebook Views, Web Views, Mobile Views, Microsite Views, Shares, Likes and Entries. 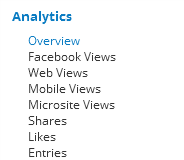 The graphs of the Facebook Views, Web Views, Mobile Views and Microsite Views look like these. The amount of Shares, Likes and Entries can be viewed in this format.